A business portfolio is defined as a collection of Strategic Business Units, commonly called SBUs, that make up a firm or a corporation. The optimal business portfolio (a dream for all organizations) is the combination of multiple SBUs such that it helps to exploit the most attractive industries or markets, keeping in mind the competitive strength and weaknesses of the parent corporation or the firm. A SBU can either be an entire company or a division of a large firm, that formulates its own strategy and has separate objectives from the parent organization. For the same, BCG Matrix was first proposed by the Boston Consulting Group. Due to the simplicity of the model, it had its own set of limitations, which was further addressed by the GE-McKinsey matrix. 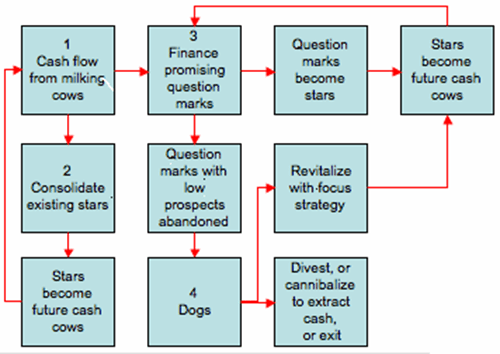 Based on the location, the strategy flow diagram depicts the actions to be taken by the organization, post analysis with the BCG matrix or the GE-McKinsey matrix. Typically Market Competitiveness of a SBU is estimated by analyzing the market size of the SBU, the market growth rate, the market profitability, the competitive intensity / rivalry, the overall risk of returns in the industry, the entry barriers, the pricing trends, opportunity to differentiate, demand variability, segmentation, distribution structure and the technological development. 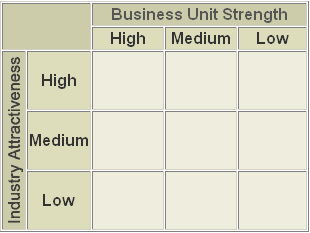 Similarly Competitive Strength of the SBU is estimated by factors such as strength of assets and competencies, market share, market share growth potential, brand strength, customer loyalty, relative cost structure, relative profitability, distribution strength, production capacity, record of innovation, management strength and access to financial and other investment resources. Now the GE-McKinsey model, like all generic strategy models has its own set of limitations. A major assumption behind the GE-McKinsey matrix is that it can operate when the economies of scale are achievable in production and distribution. Unless the same holds true, the concept of leveraging the competencies of the firm and the SBU falls flat. Also some of the factors of competitive strength and market competitiveness may be extremely important for a particular instance, while another instance may even require even other factors. The top management of the organization should decide upon these factors very carefully as there is no generic set of factors with which all SBUs may be evaluated. The relative weightage given to each of the factors of competitive strength and market competitiveness is often arbitrary. While some methodology such as the Analytic Hierarchy Process may be used to compute the relative importance of such factors, such is mostly not done. Thus the overall position of the SBU on the matrix could come under criticism. If you feel there are any more points which I could incorporate in this explanatory article, feel free to comment and let me know. By the way, have you read our article on Value Creation Strategy and Business Models? Also, you may find the article “Growth Strategies of Web Based New Generation Firms” interesting. Previous Previous post: Radox says Be Selfish!